The year 2018 was the 20th anniversary of the discovery of the second genetic risk factor to be associated with Parkinson’s. In 1998, researchers reported that variations in a region of DNA called PARKIN were associated with an early onset form of the condition. Early onset PARKIN-associated Parkinson’s, however, is rather different to other forms of the condition. For example, the PARKIN version appears to be largely isolated to the loss of dopamine neurons. In addition, it has limited involvement of the Parkinson’s-associated protein alpha synclein. Recently, researcher and advocates have written a very thought provoking report pointing out these differences and and given the nature of this form of Parkinson’s, they have asked the question, why not conduct a cell transplantation clinical trial in people with early onset PARKIN-associated Parkinson’s? In today’s post, we will discuss what PARKIN is, what early onset PARKIN-associated Parkinson’s looks like, and why these researchers and advocates are on to a good idea. Husband, father, patriotic Scotsman, and die-hard Hearts supporter (the crazy fool). In addition, Martin is a prominent Parkinson’s advocate. Diagnosed in December 2014 with young onset Parkinson’s at age 32, Martin has chosen not to rest on his laurels, and has become a very active member of the Parkinson’s community, being involved with the very dynamic Edinburgh Parkinson’s Research Interest Group, and in 2017 he started the Facebook Parkinson’s Research Interest Group (or PRIG) which now has 2100+ members (including yours truly). Title: Are PARKIN patients ideal candidates for dopaminergic cell replacement therapies? Authors: Kunath T, Natalwala A, Chan C, Chen Y, Stecher B, Taylor M, Khan S, Muqit MMK. Journal: Eur J Neurosci. 2018 Dec 26. Note: This article is part of a special edition tribute to Tom Isaacs (co-founder of the Cure Parkinson’s Trust), and there are a number of very interesting OPEN ACCESS articles in that issue. In their article, the authors propose that individuals with early onset Parkinson’s that is associated a PARKIN genetic variant are the ideal candidates for cell transplantation therapy. Interesting. Tell me more. 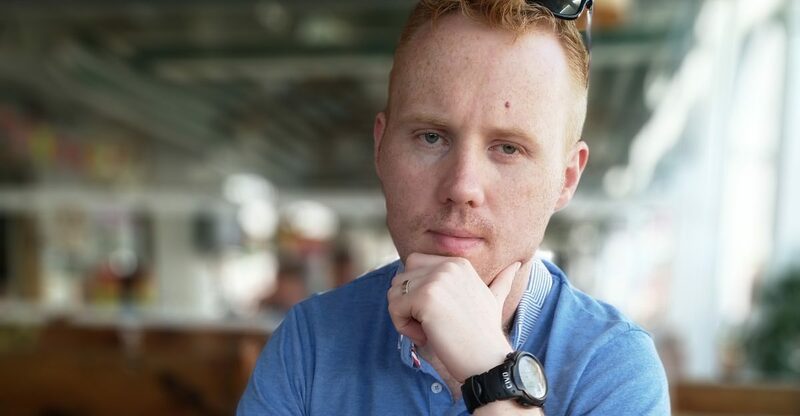 But what is a PARKIN genetic variant? Approximately 10-20% of Parkinson’s cases are associated with particular genetic variations (or mutations) that seem to render people vulnerable to developing the condition. These mutations occur in regions of DNA (called genes) that provide the instructions for proteins. We currently know of 20+ regions of DNA that contain mutations that have causal-associations with Parkinson’s. These regions have been given the name of PARK genes. The region does not always refer to a particular gene, for example in the case of our old friend alpha synuclein, there are two PARK gene regions within the stretch of DNA that we call alpha synuclein. So please don’t think of each PARK genes as one particular gene. PARKIN is one of these genes that can have Parkinson’s associated genetic mutations. In family #1, the affected individual was a female, 43 years old, born of first-cousin parents, and her two younger brothers are healthy. Her condition was diagnosed in her teens and it had then progressed very slowly afterwards. Her response to levodopa was very positive, but levodopa-induced dyskinesia were frequent. In family #2-4, affected individuals (born to unrelated parents) exhibited very similar clinical features to the subject in family #1. The age of onset was between 18 to 27 years of age. Using previous research and various techniques the investigators were able to isolate genetic variations that were shared between the 5 affected individuals. They ultimately narrowed down their search to a section of DNA containing 2,960 base pairs, which provides the instruction for a protein of 465 amino acids. What does the PARKIN protein do? The PARKIN protein appears to have several different cellular functions, but it has been most thoroughly studied in the context of mitophagy. Mitophagy involves the disposal of old or dysfunctional mitochondria. Mitochondria – you may recall from previous SoPD posts – are the power stations of each cell. They help to keep the lights on. Without them, the party is over and the cell dies. Like you, me and all other things in life, mitochondria have a use-by date. As mitochondria get old and worn out (or damaged) with time, the cell will dispose of them via the process of mitophagy. What does PARKIN do in mitophagy? In mitophagy, PARKIN interacts with another Parkinson’s associated protein called PINK1. Genetic variations in the PINK1 gene are also associated with early onset Parkinson’s. In the process of mitophagy, these two protein play important functions. PINK1 acts like a kind of handle on the surface of mitochondria. In normal, healthy cells, the PINK1 protein attaches to the surface of mitochondria and it is slowly absorbed until it completely disappears from the surface and is degraded. In unhealthy cells, however, this process is inhibited and PINK1 starts to accumulate on the outer surface of the mitochondria. Lots of handles poking out of the surface of the mitochondria. Now, if PINK1 is a handle, then PARKIN is a flag that likes to hold onto the PINK1 handle. 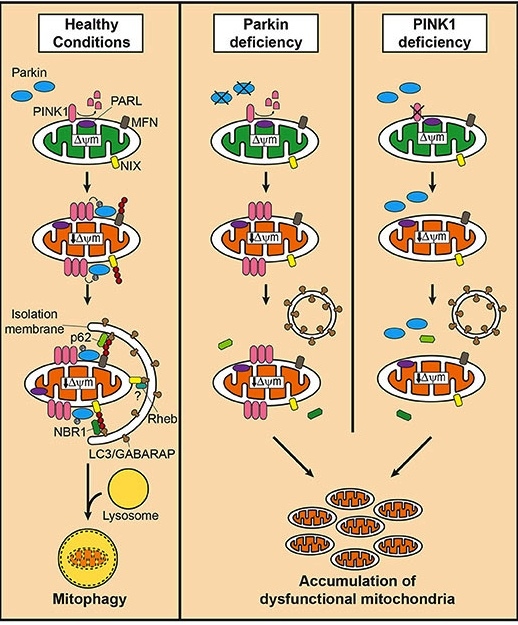 While exposed on the surface of mitochondria PINK1 starts grabbing the PARKIN protein. This pairing is a signal to the cell that this particular mitochondrion (singular) is not healthy and needs to be removed. The pairing start the process that leads to the development of the phagophore and eventually mitophagy. In the absence of normal PINK1 or PARKIN proteins, there is no handle-flag system and old/damaged mitochondria start to pile up. They are not disposed of appropriately and as a result the cell gets sick and ultimately dies. As I said above, people with particular mutations in the PINK1 or PARKIN genes are vulnerable to developing an early onset form of Parkinson’s. It is believed that the dysfunctional disposal of (and accumulation of) old mitochondria are part of the reason why these individuals develop the condition at such an early age. And remember Martin who I mentioned at the top of this post? He has a genetic variant in a region of DNA called PARKIN, which we can assume has been instrumental in his early onset form of Parkinson’s. As part of his process of dealing with his situation, Martin has been very proactively getting involved with research. Which brings us to the next character in this story. He is a Wellcome Trust Senior Research Fellowship in Clinical Science and Programme Leader at the School of Life Sciences, University of Dundee (Scotland). For a long time I have been meaning to write a post about the Parkinson’s research being done in Dundee – these guys are rockstars! Prof Muqit’s research has primarily focused on the Parkinson’s-associated protein PINK1, which is closely associated with PARKIN. But Prof Muqit is a smart guy, and he knows a good idea when he sees one. He is the senior author on the PARKIN report we are discussing today. And click here to watch the Q&A session. What does PARKIN-associated Parkinson’s look like? PARKIN-associated early-onset Parkinson’s is characterised by rigidity, bradykinesia, and resting tremor. Lower-limb dystonia may be one of the first signs of the condition. The onset of the symptoms usually occurs between ages 20 and 40 years of age, with an average age of onset in the early to mid-30s. In general, the condition is much slower in its progression than later onset idiopathic (sporadic) Parkinson’s. PARKIN-associated early-onset Parkinson’s also differs from older-onset Parkinson’s in that the individual usually has a well preserved sense of smell. In addition, women and men are curiously affected with equal frequency (as opposed to the almost 2:1 ration of later onset idiopathic Parkinson’s). Brain imaging (PET/SPECT) studies have suggested reduced dopamine transporter density in individuals with PARKIN-associated Parkinson’s (with the putamen being predominantly affected). Interestingly, the loss of dopamine fibres in the striatum are rather symmetric. If you look at the image below, you will see the ‘bird’s eye’ view of three brains: a normal healthy brain, a PARKIN-associated Parkinson’s brain, and a non-PARKIN-associated Parkinson’s brain. The yellow/red colouration indicates the presence of dopamine in the two sides of the brain. Note the loss of colouration in the two Parkinsonian brains compared to the control brain. But also note the symmetry in the colouration in the normal health control brain and the PARKIN-associated PD brain, and the asymmetric in the non-PARKIN-associated PD brain. For those readers interested in more information regarding PARKIN-associated Parkinson’s, there is a very good OPEN ACCESS outline of available online – click here to read it. Very interesting. So what does the new report suggest? In later onset idiopathic Parkinson’s, several different populations of cells in the brain are affected. There are the dopamine neurons of course (the loss of which is associated with the appearance of the motor features of the condition). But there are is also loss of other groups of neurons, such as cholinergic neurons and serotonergic neurons. In the PARKIN-associated Parkinson’s brains, these other cell types are largely unaffected. The PARKIN form of the condition appears to specifically affect the dopamine neurons. And in all of the cases of PARKIN-associated Parkinson’s that were diagnosed under 40 years of age, there is a complete absence of alpha synuclein containing lewy bodies. These are dense, circular clusters (or aggregates) of protein within cells, which are generally considered one of the cardinal features of the Parkinsonian brain. But in all of the cases of early onset PARKIN-associated Parkinson’s that were diagnosed under 40 years of age, there is a complete lack of alpha synuclein lewy bodies. The absence of alpha synuclein pathology suggests that the dopamine neurons in early onset PARKIN-associated Parkinson’s are dying via a mechanism that is different to later onset idiopathic Parkinson’s. But given the fact that the neurodegeneration is seemingly isolated to the dopamine neurons, and there is no alpha synuclein accumulation associated with it, the authors of the report suggest that individuals with early onset PARKIN-associated Parkinson’s are the ideal candidates for testing cell transplantation therapy in Parkinson’s. What is cell transplantation therapy? By the time a person is presenting the motor features characteristic of Parkinson’s, and being referred to a neurologist for diagnosis, they have already lost approximately 50% of the dopamine producing neurons in an area of the brain called the midbrain. These cells are critical for normal motor function – without them, movement becomes very inhibited. And until we have developed methods that can identify Parkinson’s long before the motor features appear (which would require only a disease halting treatment), some form of cell replacement therapy is required to introduce new cells to take up the lost function. Cell transplantation represents the most straight forward (but still experimental) method of cell replacement therapy. Traditionally, the cell transplantation procedure for Parkinson’s has involved multiple injections of developing dopamine neurons being made into an area of the brain called the putamen (which is where much of the dopamine naturally produced in the brain is actually released – and which is particularly affected in people with PARKIN-associated Parkinson’s). These multiple sites allow for the transplanted cells to produce dopamine in the entire extent of the putamen. This sounds great! Like a cure for Parkinson’s? One of the issues with cell transplantation therapy is that it is even after the cells have been transplanted, Parkinson’s continues to progress. And postmortem evidence suggests that the transplanted cells are affected by the condition. 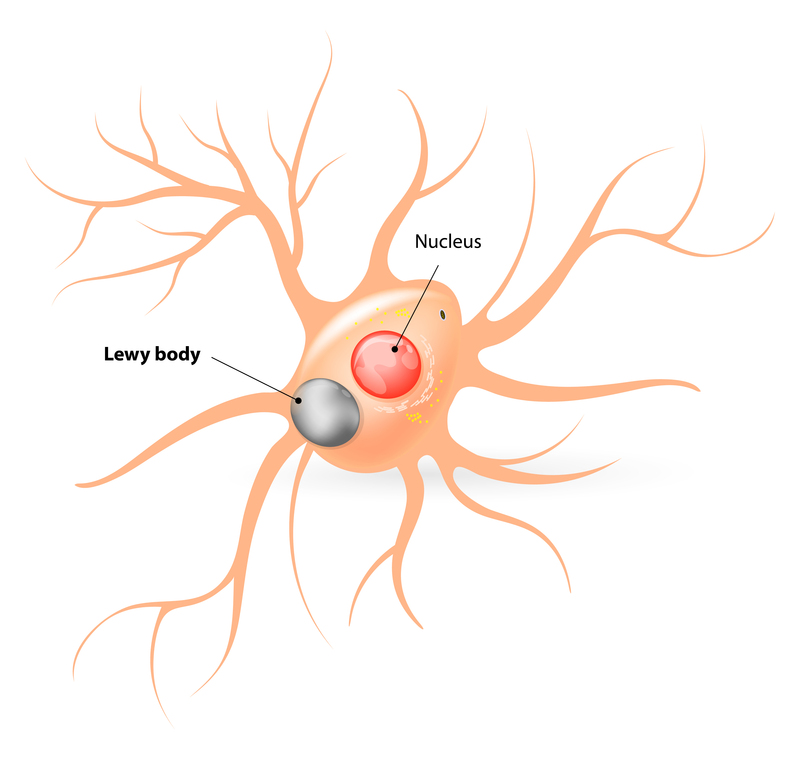 Over time, transplanted cells have been found to develop alpha synuclein-containing lewy bodies. It is believed that the alpha synuclein may be involved with this spreading of the pathology (more on this below). In addition, while dopamine neurons are replaced in this approach, other types of cells (such as cholinergic neurons and serotonergic neurons) are not. 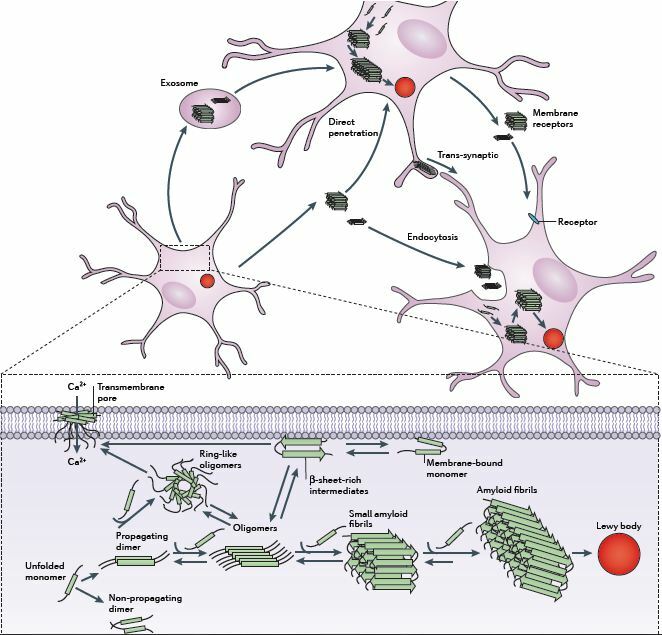 In the report we are discussing in this post today, Martin, Prof Muqit and their other co-authors suggest that given the absence of alpha synuclein pathology and the specific neurodegeneration (isolated to the dopamine neurons), people with early-onset PARKIN-associated Parkinson’s are the ideal candidates for cell transplantation therapy. If nothing else, they are the best individuals to test whether the cell transplantation therapy approach could actually works for Parkinson’s. I definitely agree with this logic. What kind of cells would they transplant? This is where the third character in our story enters the picture. 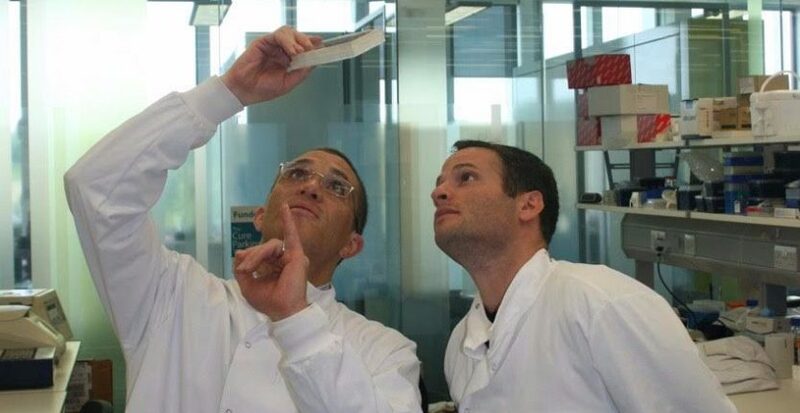 He leads a stem cell biology lab at the MRC Centre for Regenerative Medicine (University of Edinburgh). Tilo is deeply involved with the Parkinson’s patient community in Edinburgh, and he is the lead author on the PARKIN report we are discussing today. In Dr Kunath’s lab, the research team focus on developing stem cell-derived dopamine neurons for cell replacement therapies in Parkinson’s. Stem cells are cells that have the potential to become any cell type in the body. Currently, the best source of stem cells are embryonic stem cells. The process of collecting embryonic stem cells begins with a fertilised female egg cell. The egg cell will divide, to become two cells, then four, eight, sixteen, etc. Gradually, it enters a stage called the ‘blastocyst’, which is a small ball of cells. Inside the blastocyst is a group of cell that are called the ‘inner stem cell mass’, and it is these cells that can be collected and used as embryonic stem cells. 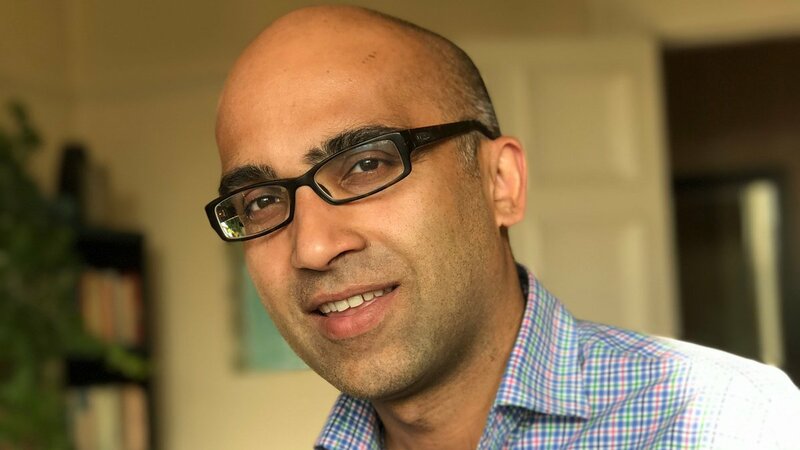 Dr Kunath and his team (and other research groups) have developed protocols that allow for the production of millions of dopamine neurons in a petri dish, and these cells could be used for cell replacement therapy. So, we have the right cells, we have identified the right population of people with Parkinson’s to test the cells in, and we have people with the right expertise to perform the study. This does sound like a good idea. So what’s the limiting factor? Why aren’t we doing it? The issue is: Early onset Parkinson’s is very rare. It is estimates that less than 1 in every 20 people diagnosed with Parkinson’s is under the age of 50. But within that population, the PARKIN genetic variation is also rare (10-15% of the early onset cases). 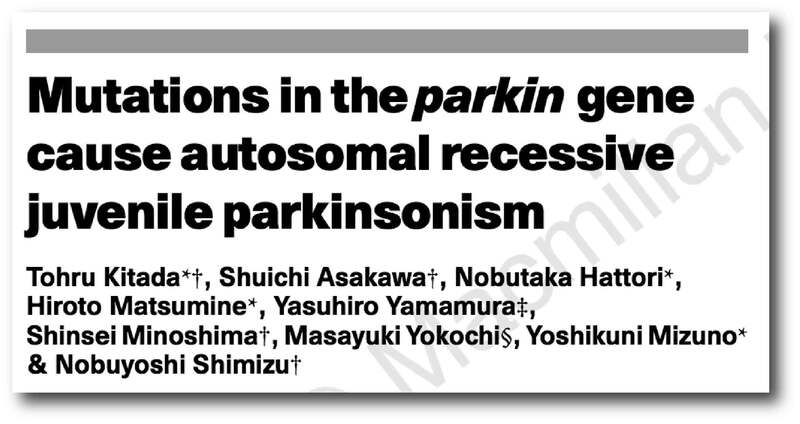 There are very few people with early onset PARKIN-associated Parkinson’s. In the UK alone, there may be a hundred or so, and not all of them may be excited about the idea of having holes drilled in their heads. 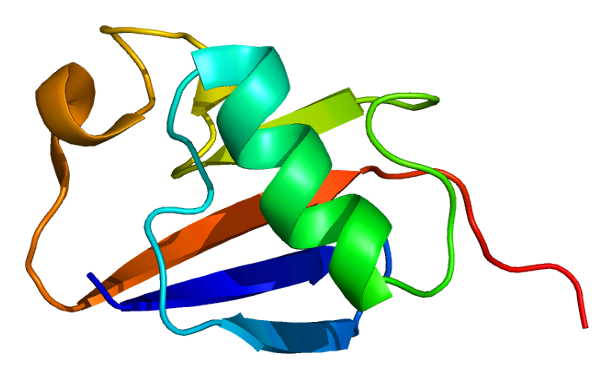 percentage of individuals with LRRK2 and PINK1 may also have predominantly dopamine cell loss). But again, these cases are equally rare. Thus, identifying the individuals with Parkinson’s-associated with these genetic variants will be the main challenge for this good idea. And in their report, the authors outlines several approaches to achieving this (such as a scintigraphy with [123I]metaiodobenzylguanidine (MIBG)). Yeah. Great idea. But what about the rest of us with Parkinson’s? Where’s our ‘good idea’ stem cell transplantation trial? Authors: Chen Y, Dolt KS, Kriek M, Baker T, Downey P, Drummond NJ, Canham MA, Natalwala A, Rosser S, Kunath T.
In this study, the researchers generate dopamine neurons from embryonic stem cells that do not have alpha synuclein in them. As I indicated above, there is growing evidence that alpha synuclein is being passed between cells, and this is possibly a mechanism by which Parkinson’s is progressively spreading. It is believed that residential alpha synuclein in a cell plays an important role in this spreading. The alpha synuclein that cells naturally produce provides the material for seeding alpha synuclein pathology. As cells absorb a toxic form of alpha synuclein that has been released by other cells, the residential alpha synuclein interacts with that new form and becomes transformed into the toxic form. And there is some evidence for this in individuals who received cell transplants back in the 1990s. They have since passed away and their brains have been examined postmortem. 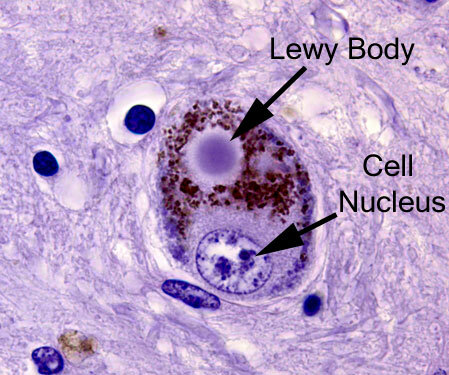 One very interesting finding from those brains is that some of the cells in the transplants (up to 10% in one case – Click here to read the research report on that case) have Lewy bodies in them. This suggests that condition is being passed on from the Parkinson’s affected brain to the healthy transplanted cells in some way. Researchers have proposed that the alpha synuclein protein may be the guilty party in this process. Because having alpha synuclein in the cell is believed to play a role in the seeding of Lewy body pathology, Dr Kunath and his team developed embryonic stem cells that do not have any residential alpha synuclein protein. And by not having any alpha synuclein in the cells, the researchers found that introduced toxic alpha synuclein could not cause the aggregation of the protein in these cells. In other words, the investigators have developed cells that could be resistant to Lewy body pathology, and these cells could be used for cell transplantation therapy. It will be very interesting to see how this technology develops. There are lots of ideas in the world, and there are even a few good ideas. What Dr Kunath, Martin, Prof Muqit & colleagues have proposed is not a good idea. It’s a great idea. One whose time has certainly come. We currently have a range of ongoing clinical trials in which neural cells derived from stem cell-based approaches are being transplanted into people with Parkinson’s (Click here to read more about these trials). But the question always has to be asked whether the right cells are being transplanted into the right individuals? It would be encouraging to see this report further discussed, with the ultimate goal of moving forward to the clinic to test whether this idea will work. Another sub-theme developed in this interesting report from Dr Kunath & colleagues is the idea of recognising different types of Parkinson’s. This is another good idea (whose time has come) and it will be a regular theme here at the SoPD in 2019. If we are going to tackle this condition, we need to be smart about how we target the right therapies to the right individuals. 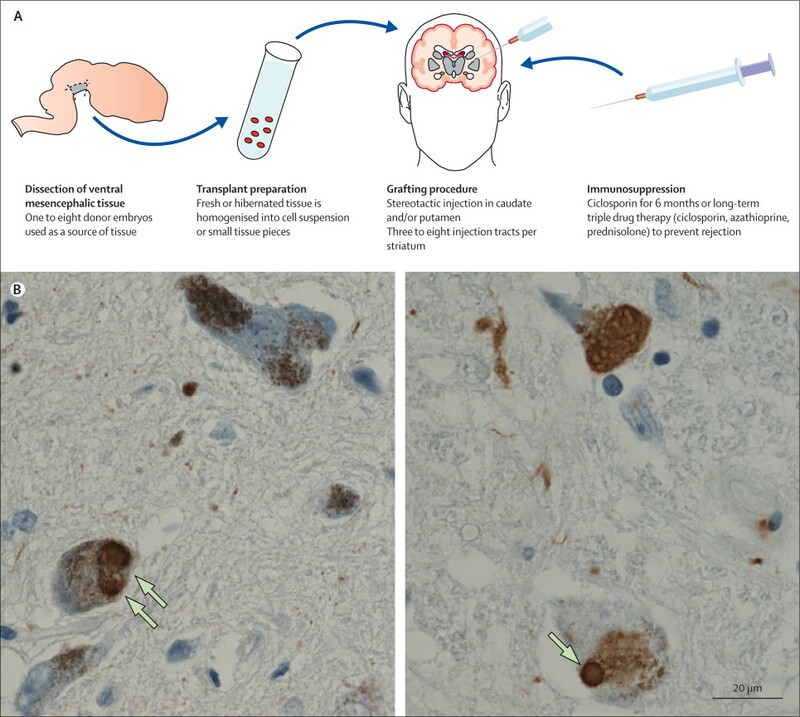 EDITOR’S NOTE #1 – It is important for all readers of this post to appreciate that cell transplantation for Parkinson’s is still experimental. Anyone declaring otherwise (or selling a procedure based on this approach) should not be trusted. While we appreciate the desperate desire of the Parkinson’s community to treat this condition ‘by any means possible’, bad or poor outcomes at the clinical trial stage for this technology could have serious consequences for the individuals receiving the procedure and negative ramifications for all future research in the cell transplantation field. EDITORIAL NOTE #2 – The author of this post is an employee of the Cure Parkinson’s Trust. The Trust has not asked for this post to be written. This post has been written by the author solely for the purpose of sharing what the author considers interesting information. Thanks for your lovely comment. Glad you liked the post. I am a HUGE fan of the Parkinson’s research nexus developing around Edinburgh-Dundee. Fantastically proactive research advocates/PD community, world-class scientists, & a rapidly growing clinical trials unit. What a fantastic combination. Looking forward to big things happening there over the next few years (and we are certainly doing our best to support it! ).